The Rebel Sweetheart. : Gadgets, Gizmos, and more at the Philippine Digital Lifestyle Expo. Gadgets, Gizmos, and more at the Philippine Digital Lifestyle Expo. Are you excited for the long weekend? I know I am! The little man and I can't wait to go out-of-town and enjoy some quality time with the rest of the family. We both deserve some R&R after last week's super busy schedule, with his quarterly exams and all. How about you? Where are you guys off to for the long weekend? If by chance you'll be at SM Megamall, why don't you swing by the digital lifestyle expo hosted by Globe Telecoms? Dubbed as "Wonderful World with Globe: Philippine Digital Lifestyle Expo", this event will bring together the latest digital trends, gadgets, and applications that can enrich today’s mobile experience. As we all know, people nowadays are more drawn into living the digital lifestyle. The increased ubiquity of smartphones, tablets and similar gadgets, the birth of innovative data plans, and the abundance of various apps are shaping the way Filipinos live, communicate and connect with each other. What they download, explore, and share online define their identity and lifestyle as digital citizens. Constantly being connected is now a must to stay abreast and be “in the know” of the latest events and trends. Whether for working or playing wherever and whenever, downloading the latest app that supports a passion for health, worthy advocacy or anything in between, streaming music and videos, playing online or as simple as making one’s presence felt or voice heard on social media through posts, likes and shares, no doubt the digital life is being embraced by each one member of the hyper-connected generation, making deeper and lasting connections through the power of the Internet. Through this Digital Lifestyle Expo, which is the first of its kind, netizens can see for themselves the latest gadgets, the hottest innovations, together with the products and services offered by Globe and their technology partners. 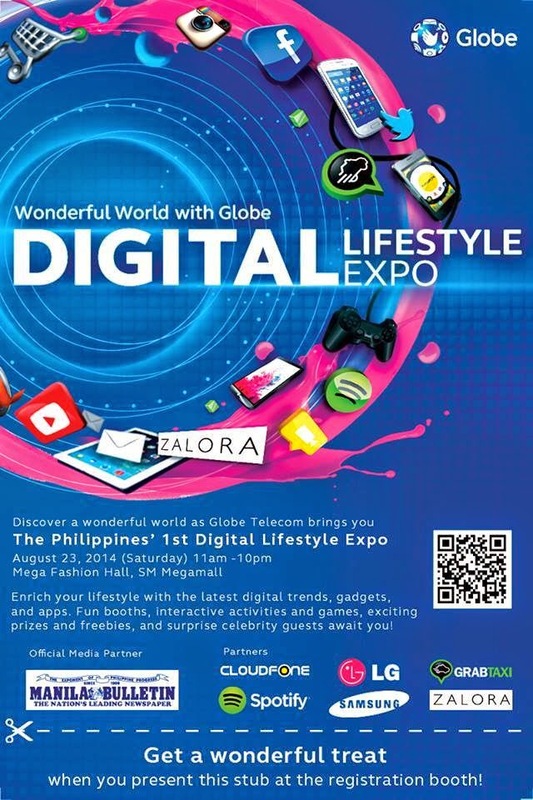 The Wonderful World with Globe: Philippine Digital Lifestyle Expo will be held on August 22 and 23, 2014, at the Mega Fashion Hall of SM Megamall, in Ortigas, Pasig City from 11am to 9pm. The event is open to the public where they can take part and enjoy the fun booths, interactive activities and games, exciting prizes and freebies and surprise celebrity guests. All these and more are lined-up for the netizens in attendance as they embrace a wonderful digital lifestyle powered by Globe. This event looks fun! Since me and my friend are in a search for a gadget, we might as well drop by at Mega.